These are cuffs. And that's about it. Other than the You.Are.Mine. stamped on the cuffs, these are just like every other pair of handcuffs you've ever seen. Except maybe flimsier. Um. They're handcuffs. They have You.Are.Mine. stamped on them, if that does it for you. Flimsy. Not very large. Uncomfortable. Nothing special. These handcuffs are no different than any other handcuffs I've owned. Well, scratch that. They're flimsier than all of the other cuffs I own. The metal bends with just a bit of pressure, so if you're planning to have a long, intense session, these are not likely to hold up for the duration. To be honest, I'm not a handcuff lover, in general. I much prefer the softness of leather and velvet restrains, but I certain understand the visual appeal of metal. Still, these are useable, but lacking in frills. These are nothing special. They do what cuffs are supposed to do -- they close, they open with a key, and they open without a key (they have a special lever on them that allows you to open them even when they're locked). They don't fit around my ankles, and didn't fit around my partner's wrists, but they fit around mine just fine. The chain between the cuffs is about three inches long, which means that you don't have a lot of options for how you use them. Again, I didn't find these to be anything special. They're a little flimsy, but other than that, they do about what's expected. Nothing more, nothing less. Which makes this review about the most boring thing ever, but there really isn't anything more to say. If you don't already own handcuffs, and want a cheap pair, get these. Otherwise, check out your other options, like these lovely black handcuffs from Spartacus. 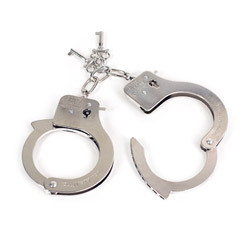 Thank you for viewing Fifty Shades of Grey You are mine – police style handcuffs review page!